Rods – you can’t have too many! You do not need a rod to go fishing! But it is far more enjoyable with one. The rod fills a dual function. You need it to cast your line and then to subdue a fish by dampening its movements. It is much easier to catch a fish with a rod than by hand lining it. The best rods are currently made from graphite. 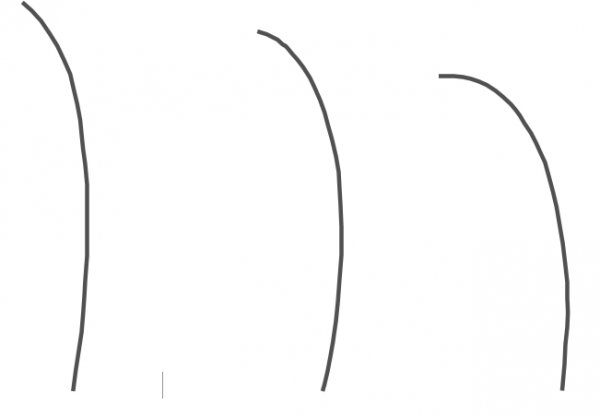 They are strong, light, flexible and straighten fast if they are bent (we call it loaded). However, they are sensitive to knocks, and if a heavy streamer hits the top part it will probably break there eventually. They are hollow and made by rolling graphite cloth around a metal mandrill, forming the rod. The binding substance used in between the graphite cloth is important and affects the rod’s characteristics. Then they are baked, and the mandrill removed. A cork handle is at the bottom of the rod with the rod inside it. The reel seat is a part of the bottom of the handle. The reel seat is light on light rods but becomes sturdier on bigger rods. The reel seat is up-locking (towards the handle) on one-handed rods but down-locking (towards the lower handle) on double handers. Rods made for fresh water usually have a hook holder (small metal loop in front of the handle), but salt water rods do not. 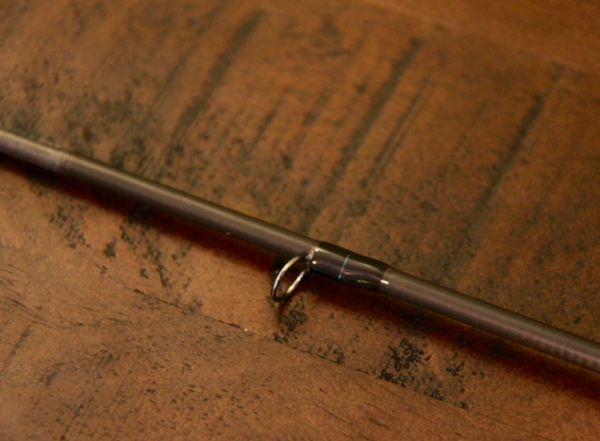 From the handle upwards we have the thickest and strongest part of the rod blank. Then the rod tapers up and ends in a very narrow end where we have the tiptop. 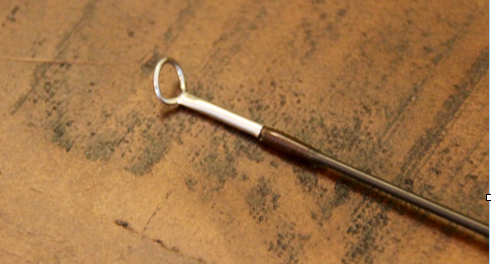 The first guide from the handle is called the stripping guide. Those two have their names, the rest 8-9 on a 9´ rod are just rod guides. There is a 24-inch distance from the handle to the stripping guide to allow for the hauls (pulling the line with the line hand). The stripping guide is the largest, and from it the loops taper down with the rod to the tiptop, which is the smallest guide. If the rod is intended for salt water use it must have a reel seat and guides that can withstand the corrosion of salt water. 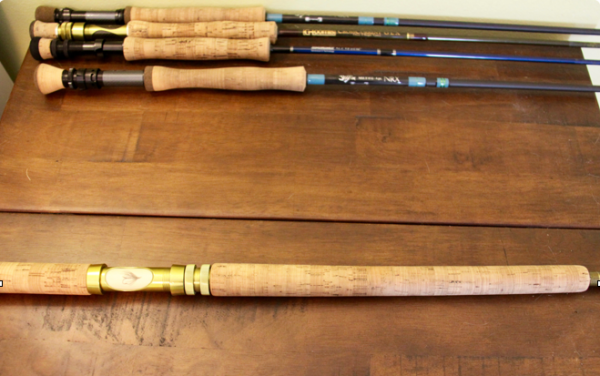 Rods can be found at all prices, to$1000 for the most expensive one-handed rods. The best rod buying advice I can give is to go for rods with some form of lifetime warranty. Beginners should avoid the stiff fast ones. There are many good reliable rod reviews available on the good and the best fly rods. If fly fishing becomes a passion, your rods will break. Start with rods in the middle of the price range if you can. Beginners do not fare well with super-fast rods since their timing needs to be very precise to cast them well. Go for four-piece rods since they are easier to transport. Back in the day the rods were made from natural substances like bamboo or cane. They were exquisitely made and very pretty. They are sought after by collectors but are not very effective in wind and where long casts are needed. The graphite rods are so much more practical today. Next on the scene were the fiberglass rods, followed by graphite rods, which have since become the standard. When we describe the characteristics of a rod we can sound confusing for beginners. The speed of the rod refers to the time the rod takes to straighten. Stiffness refers to the energy needed to bend the rod. Flex refers to the way and where the rod bends when we load or bend it. Sometimes one might think that the rods are some godlike creatures with mystical properties. The rod only wants to be straight and is dumb as a brick. All the motion is derived from the caster. There are rods that will bend into the handle when we load them (called “full flex“). A rod like that will usually straighten slowly, and we call it a slow rod. Maybe you can use a rod like that in no wind conditions. I do not like a rod like that and it does not suit my casting stroke. Then there are rods that will flex into the middle or more and get the moniker “midflex.” Usually they are medium fast rods. Finally, we have rods that will flex the tip or distal 1/3 but will only flex into the middle with a bigger load. They will straighten fast and are sometimes called tip action rods or fast rods. It stands to reason that fast rods are generally stiffer than slower rods. I prefer fast rods, and they are essential for salt water fishing. However, I have come across rods that are so stiff that I can hardly bend or load them. If I cannot load or bend a rod it is useless to me. The loaded rod casts the line. For a rod like that you just overline it until you can bend or load it. Every rod has a # number assigned to it (or weight number of the line to be used for that rod). Some guru caster has determined this by trying out various line weights for that rod. She/he decides then that this rod is a #6 or whatever. It is not some deeper truth or cosmic law. If your rod feels best to you with some lighter or heavier line weight, then hallelujah! – just use it and be happy. However, good casters generally agree on the # number assigned. The # number is always inscribed in the blank above the handle. This one is obviously #6 line 9´ four piece (690-4). 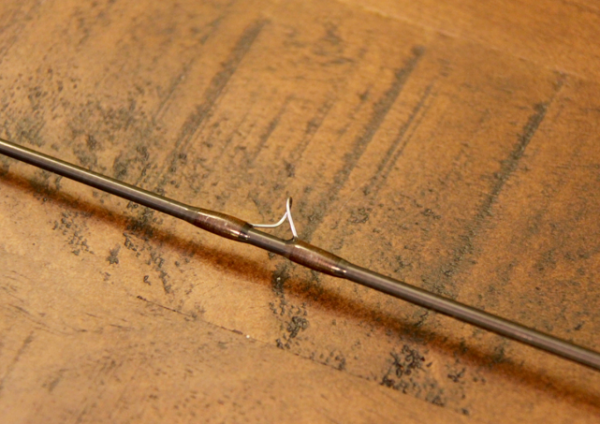 Graphite rods are light, and you can cast them all day. Of course, it is easier the lighter the rod is. One handed rods are usually from six´ to 10-11´. The generally agreed best length is 9´ #6-#8 weight for beginners of normal height. Graphite rods are fragile. After a fishing trip the cleaned and dried rod is put into the rod sock. The handle goes top first, while the top section goes bottom first. That way the thick strong handle protects the most fragile part of the rod. There are rod manufacturers that bring out “new” lines of rods every year or every other year. However, I do not understand their rod line-up. There are so many different rods in similar price ranges, and I have no idea which their quality rod will be. Then there are manufactures that only bring out new rods when they have made an improvement in the important ingredients of the rod. 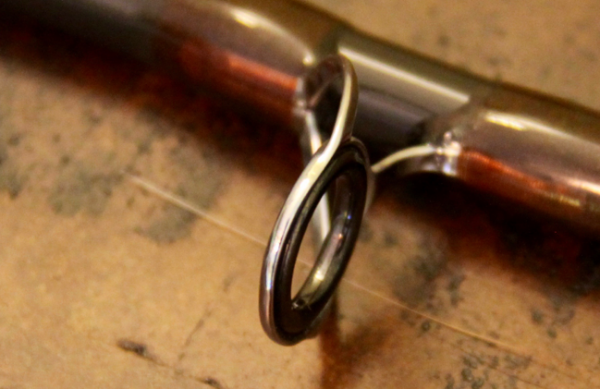 The important parts of a fly rod are the type of graphite used and the binding substance used to hold it together. I like that approach much better. These companies will have an entry level rod, a mid level rod and a quality rod in their lineup. You can rely on that the entry level rod will be a good one, the midlevel a great one, and the quality rod will be a fantastic rod. There has been progress (called breakthroughs in ads) in the graphite used, and in the binding substance. However, I assure you it does not happen every year. Do not ever think that you need to replace your arsenal annually. I have rods that are over 20 years old, and I can cast tight loops with them, and even all the fly line if I want to. I like to use these older models, and there are the memories that I connect with them that make them even more valuable. There are new rods that I can do the same with, and they are also great. The new ones are admittedly lighter and stronger, and in that sense “better” rods. When looking for a new rod you will come across the notion that you must have this type of a rod for this species of fish, and that type for another fish species in the same weight class. That is absolute and utter nonsense. The rod that suits you best for casting will be the one to use for all fish in that size category. Try out as many rods as you possibly can before settling on one. There are fly fishing clubs that have practice sessions that you can go to and try out various rods. The rods I like may not be the ones you like. You probably will end up with a quiver of rods anyway!